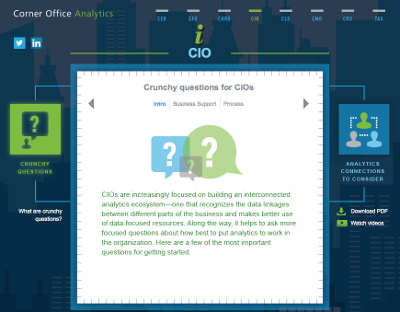 Fast Start conversation: Business analytics has landed in the C-suite. Rule #1 in communication demands you know your audience. 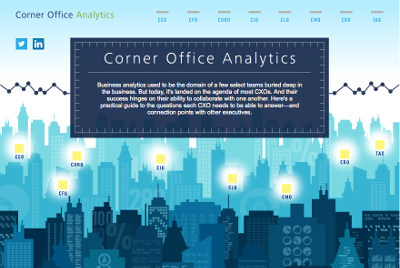 Since there is more than one corner office rule #2 states all analytics are not equal. CFO analytics may not rate the same for CMO (Chief Marketing Officer) as the CHRO (Chief Human Resources Officer), but a link exists. Corner Office Analytics (Infographic), presented by Deloitte, offers a guide to questions each CXO needs to answer. If your CXO needs answers you can expect they value those who provide accurate context for connection across the C-suite. Below, the CIO, for example. Lots on their mind, other than the joke that CIO stands for Career Is Over. Take a look at the CIO buyer profile for insight into the great resource Deloitte provides. Now, can you take a leap from noise to interpretation or decision? Can you translate information needs from the where, when, and how to why and what to meet CXO demands?